One Way Vision is printed using a Latex Ink print process. This revolutionary honeycomb window graphic allows you to have a full colour print applied to the exterior of the window whilst still letting you see out from inside. 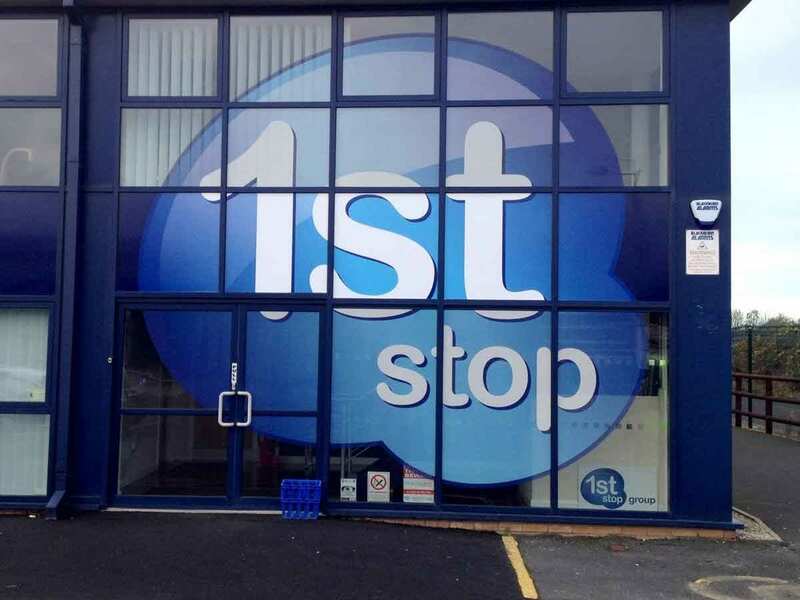 One Way Vision is ideal for use on shops, offices, buildings, cars and buses. 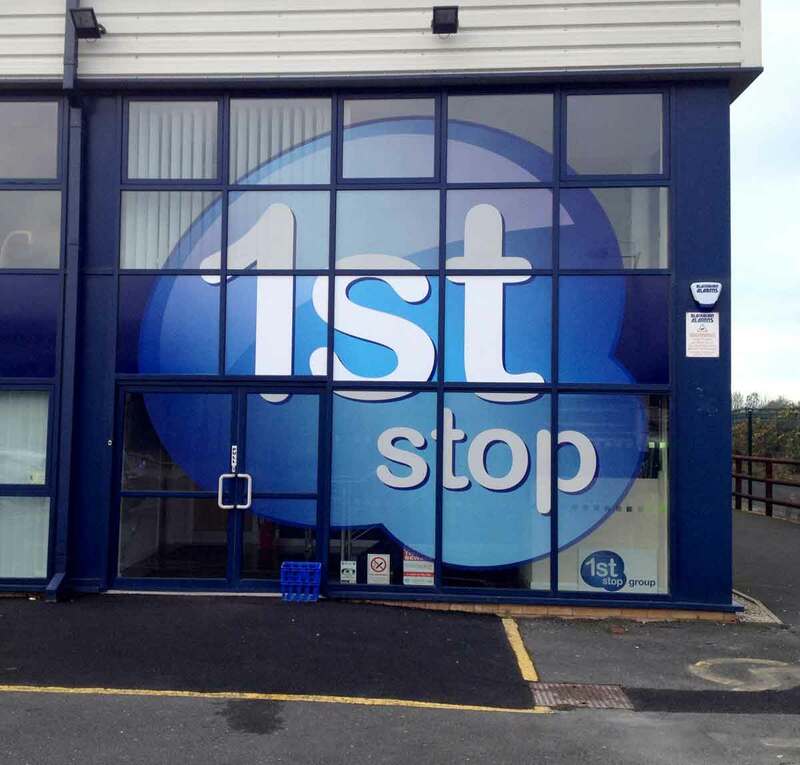 Transform any window space into a large advertising area, without losing the ability to see outside. Looks amazing on our clients taxi rear windows, easy to fit too. One way vision film is printed using a UV, Latex or eco solvent print process. This revolutionary honeycomb window graphic allows you to have a full colour print applied to the exterior of the window whilst still letting you see out from the inside. Ideal for use on offices, buildings, cars and buses. Transform any window space into a large advertising area, without losing the ability to see outside. 1. CLEAN THE GLASS! It is vital that the glass is absolutely clean before fitting a graphic. The glass must be cleaned and de-greased. Use detergent or any solvent based cleaner that does not contain silicone or oil additives. Use a plain, non coloured, paper towel or lint free cloth for the final polish. 2. Turn the graphic over and place on a flat surface. From the top edge, peel back about 25-30mm of the backing paper or film and crease it, then return the backing film to the original position. This preparation will aid positioning and fitting. Avoid touching the adhesive with your fingers. 3. Offer the graphic up to the fitting position and hinge the top edge with 2”masking tape – half on the glass and half on the graphic. Check the alignment and when you are satisfied that all is correct, lift the graphic and peel away about 25-30mm of the release paper or film from the back. Let the graphic fall into position without the adhesive taking a strong hold and recheck positioning. The folded backing will help keep the adhesive off the glass. Tack the top edge, ensuring that it goes down flat and true. Next, peel away about 6”/100mm of backing film. Start at the top centre and wipe downwards and outwards using a flat felt squeegee blade. Peel away another 6”/100mm of backing film and continue with overlapping strokes downwards and outwards until finished. Be aware that perforated film is very flimsy and easy to crease, so treat it gently. It is almost impossible to get trapped air bubbles with perforated film! Gently remove the masking tape. Pull it across the film at an acute angle, not at 90 degrees. 4. The above describes a dry application suitable for perforated films, For solid films a wet application is recommended. This involves spraying a film of fine water droplets or application fluid, such as Rapid Tac, from a plant sprayer on the glass after the graphic is positioned but before applying the adhesive. The droplets hold the adhesive off the glass until pressure is applied. This method ensures good adhesion and minimises air bubbles being trapped under the film. Any bubbles can be pricked using a scalpel or needle and then wiped down. For pvc static cling films, use the above method for application. Before removing the backing paper, wet thoroughly with water to soften the paper, so that it may be removed without lifting the film off as well. Pull it across the film at an acute angle, not at 90 degrees. 5. Ambient temperature range, for fitting, is recommended to be 15C-25C. Most adhesives work better and form a stronger bond when warm. If working in cold conditions below 10C, the gentle use of a hot air gun (or hairdryer) on the film, as it is applied, is recommended. If the film or glass is particularly cold, the adhesive will be slow to tack and the film will be more brittle and require more careful handing. Avoid application in direct summer sunlight as the film can become very soft and difficult to handle and the adhesive very tacky with a tendency to “grab” on contact. All adhesives will “cure” over a period of 6-24 hours until full adhesion has been obtained. Avoid washing or otherwise disturbing the graphic for a 24-48 hour period if possible. 6. Remember, the adhesive for any film graphic will only stick properly if the surface is clean and the film is applied correctly. 7. Removal of window graphics will be greatly eased by the use of a hot air gun or hairdryer to soften the adhesive as you peel it away from the glass. 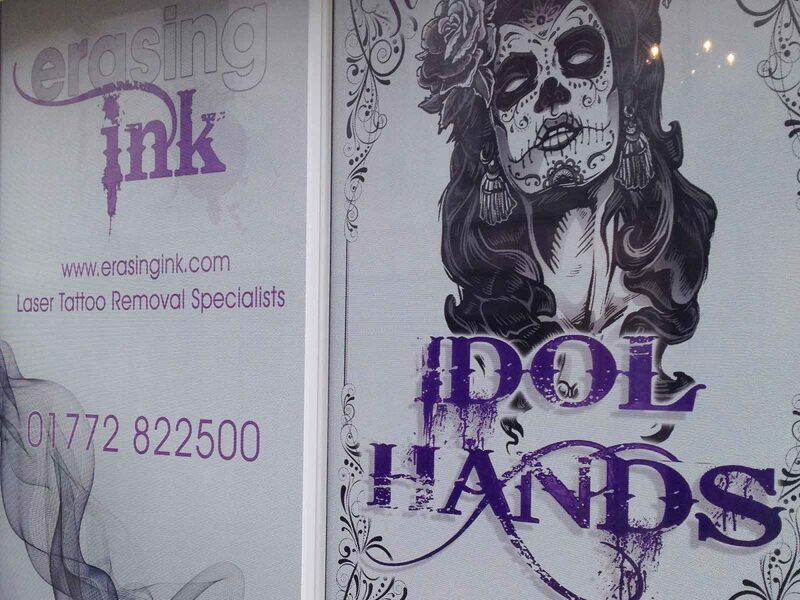 For more information or advice on fitting window graphics call John or Craig on 01253 897 840 or use the contact form to tell us your requirements. We can suggest the most appropriate solution for your display needs.